Ok. My car will only warm up the cabin if it is in motion. If I stop at a red light or it is in park, cold air comes through. If I am driving warm air comes through. I live in michigan and have two babies. I need to start the car and allow the cabin to warm up before I put my kids in there. I have taken it to a mechanic and he cannot figure it out. He changed the therostat and looked it over but nothing. He said this is very different as usually the problem is it's warm sitting still and cools as you drive it. Any ideas? 2002-06 Altima: Poor heater performance. If you air doesn t blow out warm while you are at idle these steps may help you. Nissan actually has a TSB (Technical Service Bulletin) about it. If you want all the mumbo jumbo you can get a copy from your Nissan dealer. Nissan says the coolant mixture must be between 50-55% ethylene glycol based antifreeze and water. While it s true that too much antifreeze will reduce the mixture s ability to transfer heat, I don t share their thoughts. But they are very adamant about it. They even go so far as to have you test the coolant with a REFRACTOMETER. A special tool that uses light to see the density of liquid. Cheap ones are around 80 bucks. If you want to believe that the ratio really does have to be perfect. Then it would be cheaper to drain the coolant and fill it with a perfect 50/50 mix. And if you car has over 50,000 miles, you should do it anyway. You probably don t have the system bled correctly. Fill the radiator SLOWLY as much as you can. Do it slowly so the tiny bubbles in the radiator core can work their way up to the top. I give the upper radiator hose a few gentle squeezes, it moves the water back and forth to help get the tiny bubbles moving. After you get as much water in the radiator as you can, it s time to pull out the duct tape and bailing wire. Get a metal coat hanger, and pliers. Were going to be putting it under the vent valve in the radiator cap. Don t make it too big or it wont fit down in the hole we need it to. Don t use anything skinner than a coat hanger. The valve has to open wide enough for air and water to pass through it quickly. Now put the radiator cap back on with our U wire installed. And take the reservoir tank hose off of the fill neck. Find about 3 feet of hose that will tightly fit on the port on the fill neck. Cut or drill a hole in the bottom of the jug smaller than the outside of the hose so it will make a good seal. Stick a couple of inches of the hose into the bottle, you can even use some the antifreeze as a lubricant if it s too tight. Use the left over wire from the coat hanger to hang the bottle from the hood latch hook. A step ladder will be helpful right about now. Set the parking brake, and block the rear wheels. Jack up and support the front of the car with jack stands, the bottom of the front bumper needs to be at least 22 off of the ground to get the air bubbles to go to the radiator. If you ve got a helper and a cold drink, it will make the next step pass a little faster. While keeping the bottle tool full of say it with me. 50/50 mix. Get in the car. Set heater controls to maximum heat. Mode switch to floor/defrost. Fan set to HIGH and start the engine. Run the engine at 1500rpm, giving it a little rev every now and then, until the cooling fans come on. Somewhere along this time, the thermostat is going to open so expect a bunch of bubbles in the tool and the fluid level in it will lower. Make sure you keep it filled. And keep an eye on the temp gauge too. After you don t see anymore bubbles you can turn the engine off and start cleaning up. But MAKE SURE you let the engine cool off enough before you start playing with anything. Antifreeze is sticky, if it sprays on you while it s hot, well, think of napalm. Lower the car. Crimp the hose. Remove the homemade tool. Pour the 50/50 mix in a bottle to keep for a later date. Reattach the reservoir hose on to the filler neck. Take off the radiator cap and remove the U wire. Top off the radiator. Check the cap for any deformities in the rubber seal and put back on radiator. Start car and check for leaks and to verify the heat is cooking you out of the car. 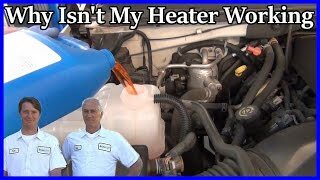 Thank you so much I was sure I would have to take my car to the Dealer and pay hundreds of dollars to fix this problem but I followed your easy to read/follow instructions and my heater is working great all for $13.99. I thank you and my families toes thank you. My heat works on and off. It'll blow hot air for awhile and then turn ice cold as if the air conditioning is on, what is the cause of this? The mechanic told me I need a new water pump but I don't see any coolant leaking or have any engine overheating issues. 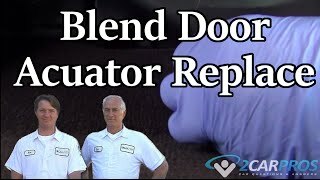 This sounds like you have a temperature blend door actuator that is out. 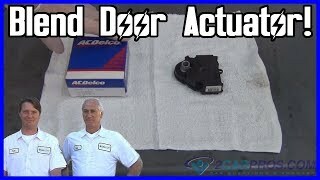 Here is a guide that will give you an idea of what you are in for when changing the actuator out. This guide can help as well. The heat is only blowing lukewarm. The radiator fluid and antifreeze is fine. The blower is working properly. The car is not overheating. During the summer months it also has seemed that the air conditioning has not been working to full capacity. My heater blows cold air when my car is idiling then when I push on the gas it will get hot and after driving about 20 25 mins the heat blows hot are even when its idiling what could that be? Check the thermostat, it could be stuck partially opened. I started hearing some sort of fan vibrate on and off, intermittenly, about two months ago, took it in for an evaluation and the mechanic and electrical could not determine what it was. It finally went away but one morning I realized I now have no heater. The A/C works fine. If some sort of fan or belt needs replacement, will the entire A/C system have to be replaced? If you don't have any heat chekc to see ifyour hoses to heater are both hot, check coolan t level as you may have a leak. It may be your blower isn't operating. Check fuses underhood and blower relay which is normally by the blower. You can then check to see if the blower and/or resistor is getting power if it is then the blower may beyour problem an dneed replacing. When I turn on the heater or defroster on. It blows cold air through windshield or vents.I held the gas pedal down to 2000 rpm and it started blowing hot air. So what do you think it is. Do you think its the thermostat getting stuck. One more thing when you turn the heater on or defroster on. Does the ac compressor suppose to be coming on and off. Like it would be normal when you have the ac on. Can anyone help me please on my question. Having to raise engine speed to get hot air means the coolant isn't flowing through the heater core properly, and that is almost always due to low coolant level. The water pump doesn't really PUMP the coolant as its name implies. It more or less nudges it along, and if it has to fight to get the coolant to rise up into an air pocket, it's not going to happen. Raising engine speed makes the water pump push harder on the coolant, and that can be enough to "get it over the top" so it flows through the heater core. If the coolant is full, have your mechanic perform a chemical test at the radiator for a leaking cylinder head gasket. If combustion air sneaks into the cooling system, that can form an air pocket. Most of the time that causes the thermostat to not open and the engine overheats, because thermostats open in response to hot liquid, not hot air, but if the leak is slow enough, it could just cause an air pocket in the heater core. When the thermostat sticks closed, no coolant can flow to the radiator so heat won't get carried away and the engine will overheat. You'll likely get really hot air from the heater. The AC compressor is supposed to run in defrost mode, and it might run in any other mode that could allow air to hit a window. The goal is to remove humidity from the air before it hits the cold windshield where it would condense and cause fogging. I have a 1980 model car without air conditioning. After driving an hour in rainy or foggy weather, I need a rag to clear the inside of the windshield. I used to have an identical '78 model with air conditioning. With that one, when you'd turn the defroster on, a fogged windshield would clear in about five seconds. Ok thank you I will let you know what it is. Got it fixed top hose and lower hose clamps were loose. Tighened them and we got heat now. Thanks for you help. The heater works fine when I'm driving - until I come to a stop sign or a red light, or when traffic slows down my speed. Then the heat fades away and the fan blows cold, outside air. If I put the car in Park and press the accelerator, I can get heat. What's the problem? This sounds as if yo have a vacuum leak in the vent / heater system, this can be checked with a hand vacuum pump to see if the system is holding vacuum, start here. I Have No Dash Lites, No Power Windows, No Heater, No Power Locks, Etc. What Can Cause This? Ps. And No Ck Engine Lite. The Car Heater Will Work Fine When The Car Is Moving. It Blows Out Cold Air When I Stop. It Heats Up Fine When I'm In Motion.